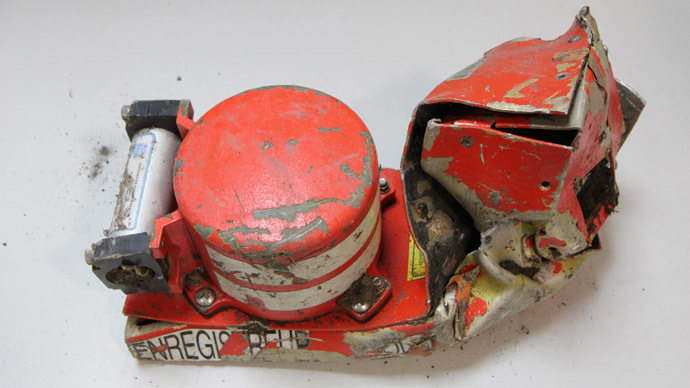 The data from the second black box has shown the co-pilot in the Germanwings plane sped up several times during the descent, according to the French air accidents investigative body. The initial findings from the plane’s flight data recorder indicate 27-year-old Andreas Lubitz used the autopilot to direct the jet towards the ground. “Several times during the descent, the pilot adjusted the automatic pilot so as to increase the speed of the plane as it descended,” the French air accidents investigation body BEA said in a statement. Lubitz had "apparently used his tablet computer to search the internet for ways to commit suicide and for the safety features of cockpit doors," according to German prosecutors. The latest discovery comes a few days after a video clip from a mobile phone emerged. The footage allegedly shows the chaos inside the plane, with passengers screaming “My God!” Several European media outlets confirmed it is genuine, but it was questioned by prosecutors. The phone had not survived the crash, but the memory card on which it was stored had, the two media outlets said. On March 24, the Germanwings plane with 150 people on board crashed in the French Alps. Lubitz is suspected of intentionally steering Flight 9525 to its doom, and locking the captain out of the cockpit. On Thursday, German prosecutors confirmed Lubitz had been researching suicide methods and cockpit door security in the days before the crash. His ex-girlfriend also told media the co-pilot had been planning to do something that would "make everyone remember him." It took more than a week to find the second black box from the crashed plane and it was found by the only woman on the search team, 32-year old Alice Coldefy. She discovered it on the first day she began work on the crash site. "Everyone was happy,” she told AFP. “It was a relief... a relief for all the people that had been working there for a week-and-a-half without a break." It was rushed to Paris immediately where experts were quickly able to analyze its contents. She described the extremely difficult conditions in which rescue teams had to work, having to scrabble around in mountain scree and debris to look for clues. "Physically, the hardest thing was all the dust that we kick up. We're working with masks on, but even then it's hard to breathe. We need to use ropes in the steepest areas," she said.